Aris wrote: Could you test a clean setup of CustomCssfoFx files with only 'tabs not on top' enabled (compared to default setup)? Many thanks for CTR, I've found it very useful. I have a small cosmetic request: I use the Firefox menu and have the FF button displayed (transparent, as icon only) not because I want to use it, but just to see the icon there. For a classic appearance what I'd really like is to turn the button off entirely and instead insert the standard icon chrome://branding/content/icon16.png at the left corner, but my attempts to do that have failed, possibly because they conflict with CTR. (Or if that's not possible, leave the button there as icon only and change its icon to the full-color one.) Can you show me how to do this? And does it matter whether the code is in CTR's box or userChrome.css? You are probably looking for the OS titlebar with that icon. Go to customizing mode and enable "titlebar". Aris wrote: You are probably looking for the OS titlebar with that icon. No, obviously I know how to do that, but I don't want to give up a line of screen space. I just wanted to have that icon on the Firefox titlebar instead of the simpler one associated with the Firefox button. As I said, it's a small thing, but I think I found myself fighting with CTR trying to put it there. Thank you so much, Aris! That looks like more work than I meant to put you to, but I suppose things get complicated with so many options in CTR. I found that the button/space adjustments crowded the menubar together, so I just left them out, and added a bit of top padding margin to the icon. The result is a perfect match for the previous CTR appearance with button icon, and if there is some context it screws up in (tabs not on top?) I don't use or encounter it. I'm very fond of that classic icon. Last edited by semigeek on March 2nd, 2018, 12:37 am, edited 2 times in total. I haven't tested the code on WinXP, but the glitch is caused by your "padding: 2px 0 0 0 !important;" mod. Try "margin-bottom: -2px !important;" instead. If you only need apply code for maximized mode, use this rule "#main-window[sizemode="maximized"]...". Respectively use "#main-window[sizemode="normal"]..." for non-maximized window. No, as I said before the glitch occurs with or without any icon swap. (On XP anyway, which I'd understand your not paying much attention to these days). But please don't worry further about this; it's working just fine for me now, a nice final touch to tweaking FF 52. In version 1.7.3. the tabs toolbar is taller than in the version 1.7.1. corrected by your code here. 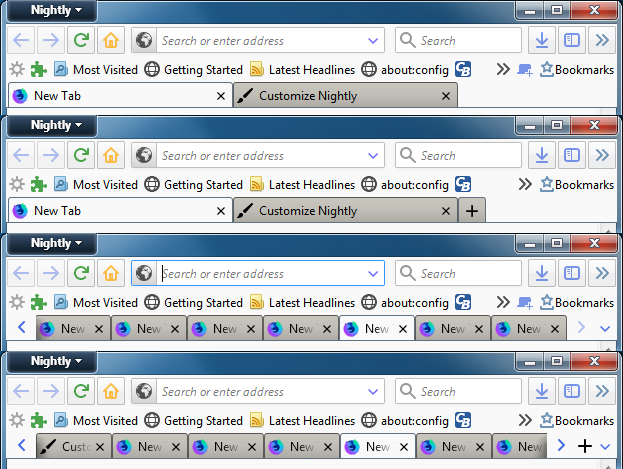 For "tabs not on top" height value requires to be reduced by 1px to keep the same height tabs on top offer. 1.7.4 adds these values to "tabs not on top" modes CSS file. "Classic squared tabs" will override that value, but you can change it through general_variables.css.